SOLD! Andrey Shestakov closes deal on this used 105' Mangusta! : Atlantic Yacht & Ship, Inc.
SOLD! Andrey Shestakov closes deal on this used 105′ Mangusta! Word from Andrey Shestakov reports that he has closed a deal on this used 105′ Mangusta yacht! In the first place, this used 105′ Mangusta was in perfect condition. All things considered, the former owner lightly used her which is why. Equally, with only 700 hours on her engines, she was barely broken in. MTU twin diesel engines power this yacht. Furthermore, his yacht performs the way you would expect a Mangusta. And, this yacht was especially well-built with Overmarine participating in build process! The build process was particularly successful with this hull can be see with this used 105′ Mangusta. Overmarine became the place where the most successful yacht technologies were developed. This includes developing and implementing state of the art techniques. In fact, these techniques allowed this yacht to come out on the leading charts of all of Europe. You will love this clean and contemporary design. The luxurious and practical design is sure to continue impressing for all her future guests. 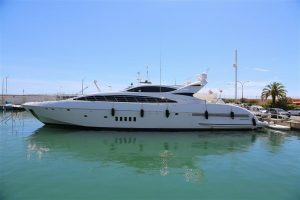 For more information on this sold used 105′ Mangusta yacht be sure to contact Andrey Shestakov today!